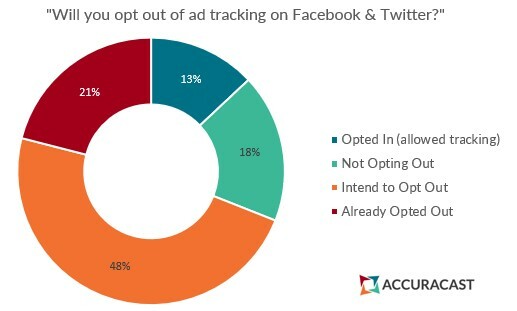 A survey of UK social media users found that 69% of users have already or intend to opt out of ad tracking on Facebook and Twitter. Could this spell the end of digital marketing as we know it? In the lead up to GDPR, we asked social media users if they would opt out of ad tracking on Facebook and Twitter. GDPR requires social networks to give users the choice to opt out of tracking. Opting out does not mean these won’t see any more ads. It just means the ads will not be personalised to users’ interests. 21% said they’ve already opted out of tracking. Results of the survey are based on 2,322 votes from social media users aged 13 and over, in the UK. Marketers may find the news alarming. If 69% of social media users actually opted out of tracking, this could make social media marketing more difficult, simply because targeting the right audience would not be as scientific as it currently is. The good news is that users are not quite as likely to opt out of ad tracking as they say they will. A white paper from the Information Technology and Innovation Foundation cited a number of studies from Pew Research, Springer, and ScienceDirect, all of which found that people say they want privacy, but very few actually act on it. Similar research carried out after Apple introduced ad blocking features on iPhones found that the Limit Ad Tracking feature in iOS had been adopted globally by 18% percent of total iOS users and by only 16.5% of iOS users in the UK. The vast majority of respondents across all studies either wanted to exchange their information for something of value or were unconcerned about organisations collecting their information. The key takeaway for marketers is therefore to ensure their proposition is perceived as adding value for their users. For social networks, though, the question is whether users understand the value of the service they are getting for free. If users opt out of tracking, they will see more irrelevant ads, which could put them off using the networks in the long run. Whilst digital marketing isn’t going to disappear, marketers will need to step up to the plate if they want to get their message in. More power has been given back to the user. Don’t pester with aggressive remarketing tactics, i.e. implement a frequency cap, and vary your message / offer.